Savannah State University is Georgia's oldest public historically black university. From its inception as the black land grant college in1890, the roots of black activism were a core element of the school's existence. As a young boy, Savannah State's founder Richard R. Wright was asked by General O. O. Howard, "What he should tell Northerners about the newly freed slaves in the South?" Wright boldly responded, "Tell them that we are rising." Years after this encounter and as the leader of Georgia State Industrial College for Colored Youth, (Savannah State University's forerunner) Wright and many of the citizens of Savannah bravely and brilliantly advanced the ideas of black independence, self-reliance, and equal rights. These concepts would later be used as motivating factors in orchestrating demonstrations and boycotts in the Civil Rights movement in Savannah. In this provocative exploration of the issues of race, politics, and higher education in Savannah, Georgia, Brooks unveils how Georgia's political climate affected the growth and progression at Savannah State University. 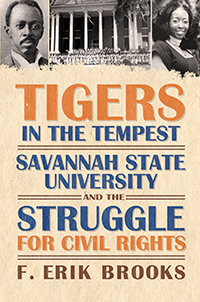 Brooks interweaves local, state, national politics, the history of the university, and the Civil Rights movement as a backdrop to showcase Savannah State University students' participation in the struggle for equality from the institution's beginning in 1890 to the election of Barack Obama as the first African American president of the United States in 2008. Additionally, Brooks reveals that not only have students fought for civil rights issues external to the university but they have also fought for rights internal to the university.